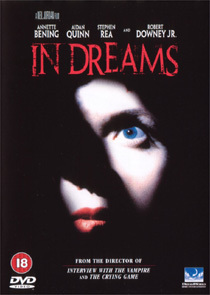 A woman is slowly driven insane by recurring nightmares about an abducted chilld. In Dreams is a heavily stylised, kaleidoscopic thriller. The first two thirds of Jordan’s hypnotic film are very compelling; with several bewitching sequences that will linger in the mind long after its disastrous last act is a distant memory. Bening’s performance is sublime, but it’s completely undermined by Robert Downey Jr’s ludicrously overwrought, scenery-chewing serial killer. The picture is presented in 1.85:1 format (with 16:9 enhancement), with a rich 5.1 Dolby Digital sound mix (at 448kbps). The transfer is generally very good, supporting some excellent cinematography. The disc offers only a trailer and booklet as bonus materials (can four pages constitute a “booklet”?) Since the film didn’t exactly set the box office alight it’s understandable that the studio wanted to cut their losses, but it’s a shame that the disc doesn’t have a director’s commentary track: Jordan’s comments would have given invaluable insight into what he was trying to achieve.